Past and present are reconciled in the collection presented by Myriam Gallego. Old details, imbued with a romantic and legendary appeal, are combined with modern, cutting-edge approaches dominated by a linear, minimalist and futuristic appeal. A sense of sumptuous elegance predominates in a range of highly feminine accessories in which we might highlight the creation of bell-like shapes, combinations of materials and aged appearances. The types of leather employed presentworn finishes which in some cases, contrast with softer textures such as suede and velvet. The spectrum of colours is extremely varied, based on shades that range from tobacco and graphite to crimson or from blue to petroleum. The most elegant line from Puntotres is dominated by silvery metallic accessories and glacé lamb that is soft and warm to the touch. For a more casual style this brand proposes bags, wallets and belts made of aged leather in different textures and based on an entire range of browns, golden and rusty shades. The urban line from this company is characterised by animal designs-snakes and crocodiles - embossed on soft and fine materials. The most sophisticated creations are based on discoloured snakeskin, fur with zebra and leopard patterns and the use of an extensive range of metals and old gold. These leather items are combined with a line of extremely feminine high-heeled shoes. shoulder-bags for day-wear and elegant and sophisticated bags in suede for evening-wear. Other models include muffs, for warming the hands on the coldest days. In these designs we might highlight the use of gathered pockets and flapsfastened with injected zips. The types of material employed also reflect a sense of glamour, including sweet glacé lamb, long-haired soft fur, suede and steel. The interiors are made of 100% cotton and dyed to contrast with the external leather finishes, featuring small compartments that enable wearers to locate their mobile, keys or purse with ease. Wallets, belts, mobile-holders and card-holders complete the range of "desirable objects" from Lupo. As a new feature, travel accessories such as jewellery cases and watchcases will be presented in leather cloth and suede. The men's line known as Urban Star presents a series of geometric shapes, based on a sober style that extends throughout the entire bag collection. Nobuck will present a range of bags and cases for next winter that combines different materials. As in a patchwork, aged varieties of leather are combined with warm materials such as velvet and wool. Bags are presented in different sizes. With regard to formats, we will come across everything from small hand-held bags to large cases, always in brown, leather and toasted shades, in addition to classic black. Nobuck will also present accessories at the fair for next summer. The main newfeatures consist of the patterns, which are employed in two highly modern lines: Prensa, basedon newspaper cuttings, and Jazz, featuring images of instruments associated with this musicalstyle. The bags are made of metallic materials, gilded or silvery, or feature seafaring motifs, refreshing the most wintry fashion. 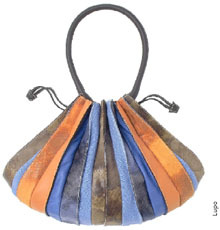 The decor of old Russian palaces provides the inspiration for the bags produced by Luna Llena. Classic, dark colours such as black and brown are imbued with new life through the incorporationof a series of original embroidered features in yellow, red, blue and green. The patterns are not the only original feature. Thus, different metal pieces are employed to create small bags that can be used for different social engagements. For day-wear the brand proposes bags made of woollenballs in different colours. Leather accessory companies have also created a series of essential complements designed toenable men to achieve the perfect image they seek. Greek motifs inspire the new collection from Olimpo, which presents an elegant appeal based on a sense of simplicity. The brand's belts mainly employ cowhide, both inside and out. Its emblematic braided models combine different varieties of leather and different colours, such as hazelnut with pink and sky-blue with green. Wallets and an entire range of travel items such as suitcases, suit-holders and trolley-cases complete this exclusive men's accessory collection. Gilmart combines design and prime quality thanks to its selection of optimum materials of soft texture. On this occasion, the brand has drawn inspiration from the forest in order to create a range of belts for next Autumn-Winter. Earthy shades, ochre, dark green and intense orange andred endow these accessories with a sense of warmth. Woollen pieces are also incorporated in order to make them more comfortable and flexible. The most daring designs in this new collection will also present imitations of exotic materials and serigraphed sail cloth. The buckles and metal appliqués are hand-polished, guaranteeing a uniqueand characteristic finish. The products presented by Manuel Acosta are aimed at men with medium-high purchasing power who appreciate quality materials and finely-worked designs. The belts are made of non-exoticmaterials, combined with leather by-products, the majority of which are braided, featuring an average width of 35 mm, which approaches a unisex format. Blue, orange, pistachio, brown and beige light up these product ranges. We will find a predominant use of leather in different shades, combined with waxed cord and matching calfskin.